Hard Hitting Promotions returned to the beautiful Fillmore in Philadelphia for the second time since their debut there a year ago. They put on an exciting 8 bout card Friday night before a sold out crowd. In the Main Event Welterweight Ray “Tito” Serrano, 24-5 (10), of Philadelphia, PA, lost a close exciting decision to Malik “Iceman” Hawkins, 13-0 (9), of Baltimore, MD, over 10 rounds. In the first round it was evident Serrano was stronger but Hawkins quicker. In the second round Hawkins continued using his effective jab and elusive defense causing Serrano problems. In the third round Serrano started getting in body shots on Hawkins. Serrano ended the round with a border line left hook followed by another left hook. In the fourth round Serrano started by landing a left hook to the chin of Hawkins who shook his head like it wasn’t as hard as it looked. The rest of the round both fighters mixed it up well. Hawkins was landing right uppercuts while Serrano landed left hooks. In the fifth round Serrano landed a stiff jab knocking back the head of Hawkins. A right uppercut to the chin from Hawkins made Serrano hold. Hawkins ended the round with a double left hook to the head of Serrano. In the sixth round Serrano started things off with a left hook to the chin of Hawkins. Hawkins came back with right uppercuts to the chin. Serrano rocked Hawkins with a right to the chin just prior to the bell. In the seventh round Hawkins was ripping right uppercuts to the body and chin of Serrano. Serrano came right back but Hawkins got the better of it in the round. In the eighth round both fighters landed left hooks to the chin at the same time. Serrano landed a solid right to the chin of Hawkins. In the ninth round Hawkins landed a right followed by a left to the chin rocking Serrano. Serrano came back landing a pair of rights to the chin. Just prior to the bell, Serrano landed another pair of rights to the chin of Hawkins. In the tenth and final round with the fight on the line both landed left hooks to the body. Serrano landed a right followed by a left to the chin of Hawkins. Whether Serrano did enough to pull out a draw would be determined and in the hands of the judges. Judge Lynne Carter scored it 98-92, Justin Rosenstein 96-94 and Dewey LaRosa 97-93. This writer had it 96-94. Referee was Shawn Clark. Super Bantamweight southpaw Tramaine “Mighty Midget” Williams, 15-0 (5), of New Haven, CT, easily defeated Antonio “Tony” Rodriguez, 12-21-1 (5), of Durango, MEX, over 6 rounds. In the first round the shorter southpaw Williams was on the attack landing four straight left hands to the body and head of Rodriguez. Several more times the “slick” Williams landed lead left hands to the chin of Rodriguez and evaded return punches. In the second round a straight left from Williams to the chin drove Rodriguez into the ropes. Rodriguez landed a right to the body of Williams which may have been the best punch he landed up until then. In the third round Williams landed a 3-punch combination to the body and head of Rodriguez. Whenever Rodriguez and Williams clinch Rodriguez gets in some of his best punches against the much faster Williams. In the fifth round Williams landed lead left’s to the chin of Rodriguez three different times. Rodriguez came back landing four unanswered punches that didn’t seem to have much effect on Williams. Williams landed a combination to the chin of Rodriguez who came back with a right of his own. The sixth and final round inside Rodriguez is able to get right uppercuts to the body of Williams. Rodriguez landed a lead right hook to the side of the head of Williams. The ring physician was brought in by Referee Ron Bashir to check a cut along the right eyebrow of Rodriguez that the referee said it was from a punch. The action ending the last twenty seconds was furious up until the bell. Judges Constatino 60-53, Rubenstein 59-55 and LaRosa 58-56. This writer had it 60-54. 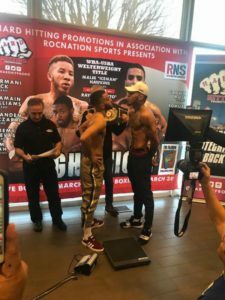 Super Middleweight Ronald “Akeem” Ellis, 15-0-2 (10), of Lynn, MASS, defeated Taneal Goyco, 9-11-1 (4), of Philadelphia, PA, over 6 exciting rounds of action. In the first round Ellis stormed out of his corner landing right hand after right hand to the chin of Goyco who mostly covered up taking punch after punch. In the second round it went almost the same way until the final minute when Goyco backed Ellis against the ropes. There was no quit in Goyco. In the third round Ellis slowed down ad started boxing using his jab. Goyco had Ellis holding on after landing several wide left hooks to the head. Both boxers threw and landed left hooks to the chin with Goyco’s ending the round. The fans loved the finish. In the fourth round a right hand from Ellis dropped Goyco who was up immediately but took the 8 count from Referee Clark. Goyco continued bobbing and weaving trying to get away from the punch Ellis was throwing and out of nowhere Goyco rocked Ellis with a wild left hook to the chin just prior to the bell. In the fifth round Ellis was on the attack but Goyco “fighting on instinct” was dangerous with every wild punch he threw. The round ended in a close one but Ellis seemed to have the edge. In the sixth and final round Ellis would land a jab knocking the head of Goyco back only to have Goyco coming back with a punch of his own. Midway through the round the boxers bumped heads causing half a minute of stoppage. Both fighters exchanged solid left hooks to the head in this very exciting crowd pleasing match right up until the end. Judge Carter 59-55, LaRosa and Constatino 60-53 as did this writer. Super Lightweight southpaw Jeremy “King” Cuevas, 8-0 (6), of Philadelphia, PA, came back from a knockdown to defeat Efrain “Macho” Cruz, 4-5-1 (1), of Viequs, PR, in another exciting 6. In the first round Cuevas pushed forward backing Cruz up who was throwing back wildly. Both fighters exchanged left hooks with Cuevas ending up with a left to the chin of Cruz. In the second round Cuevas ran into a Cruz right hand and down he went for the first time in his short career. He struggled up beating the count of Referee Clark and worked his way back and had Cruz in trouble several times though Cruz was always dangerous. In the third round it was mostly all Cuevas who was back in form with his many fans rooting him on. In the fourth round both fighters had the fans cheering on with Cuevas taking the round with mostly right hooks and following with left’s to the chin of the ever fighting back Cruz. In the fifth round Cuevas landed a lead left making Cruz duck into a right to the head. Cuevas rocked Cruz with a straight left to the chin. It was Cruz coming forward knowing he was behind but ran into a Cuevas left to the chin. In the sixth and final round Cruz landed a solid left hook to the chin of Cuevas. Cuevas came back landing a double jab to the chin with Cruz coming back with a right to the chin. Cuevas landed a combination to the head of Cruz who once again came right back. This was following the exciting Goyco-Ellis bout keeping the fans cheering. Judges Carter had it 59-55, Rubenstein 59-55 and LaRosa 59-55 with this writer having it 58-55. Heavyweight Darmani “Rock Solid” Rock, 11-0 (7), of Philadelphia, PA, knockout out Ronny Hale, 4-12 (4), of Austin, TX, in 1:07 of the second round of a scheduled 6. In the first round Hale came out swinging but the former top amateur Rock was ready for him. Hale making his second appearance in Philadelphia after scoring a knockout win against an opponent making his debut was in with a different kind of opponent tonight. In the second round Rock landed vicious body shots before finally dropping Hale for the count by Referee Ron Bashir. Super Lightweight Branden “The Gift” Pizarro, 9-1 (4), of Philadelphia, PA, came back big after suffering his first loss defeating Pablo Cupul, 9-24 (5), of San Diego, CA, over 4 rounds scheduled for 6 cut to a 4. In the first round Pizarro started off tossing Cupul to the canvas getting warned by referee Clark. From that point on Pizarro handled the shorter Cupul for the most part. In the second round Pizarro continued dominating Cupul hurting him with a combination to the head. Pizarro ended the round with a left hook to the chin of Cupul. In the third round Pizarro was all over Cupal hurting him with left hook body shots. Referee Clark warned Cupal for hitting behind the head. All three judges and this writer had it 40-36. Super Lightweight Sam “Tsunami” Teah, 13-2-1 (5), of Liberia living in Philadelphia, PA, stopped Orlando Rizo, 19-13 (11), of Vieques, PR, at 2:33 of the first round in a scheduled 6. In the first round Teah dropped Rizo with body shots three times before Referee Bashir called a halt. In the first bout of the night Super Welterweight Joey Alday, Jr., 7-0 (7), of Odessa, TX, stopped southpaw Michael Crain, 1-2 (0), of Smyrna, DE, at 1:28 of the third round of a scheduled for 4. In the first round the taller Alday used his reach well while Crain occasionally got inside with some good body work. In the second round Alday’s timing seemed to get on track landing a good left hook on the southpaw Crain’s side of the head. He would follow up several seconds later with a good lead right hand to the chin of Crain. Crain used his jab to get inside with a body shot but can’t seem to reach the taller Alday’s chin. A combination left right from Alday to the chin of Crain dropped him. The bell sounded as Crain got up from referee Shawn Clark’s mandatory 8 count. In the third round Alday continued the attack with solid left hooks to the body and head. Finally a left hook from Alday to the chin of Crain dropped him to a knee. Referee Clark wisely called a halt as Crain got to his feet. As I sit here at five PM on a Saturday afternoon in Connecticut – the blue hour – I honestly can’t believe the sheer terror that is the fight before me on the television. Indeed, the Luis Ortiz-Malik Scott heavyweight bout transpiring before me is so amateurish, so sluggish, so entirely unprofessional that it represents for me all that’s wrong with boxing at the moment. Make no mistake about it, Scott – who is throwing nary a punch – is engaged in the low risk-high reward philosophy. He’s getting a decent payday for fighting on HBO, no doubt, AND he’s avoiding risk by literally not engaging with his opponent. Sad…of=r comical. Or both. Ortiz has struck me as a surly dude, but I actually feel bad for the guy right now. Here he is, the supposed menace of the heavyweight division, and he’s engaged in a bout with a guy who will – not – fight. Max Kellerman is essentially offering apologies on behalf of HBO while Twitter is groaning in dismay. There’s a big UFC fight on pay per view this evening. It promises excitement. Those who will compare boxing to MMA this weekend will be looking at a one sided contest indeed (and yes, I’m still keeping Danny Garcia’s upcoming tuneup this evening in mind). I say this, by the way, as someone who clearly prefers boxing out of the two sports. I care about boxing, too, which is why I feel the pain of my fellow fans of the sweet science at the moment. Still, there’s a silver lining her. Next week promises to the single most definitive matchup since Mayweather-Pacquiao. That’s right, I’m talking about the Sergey Kovalev-Andre Ward pay per view event next weekend. It may not guarantee thrills, but it guarantees the best fighting the best…and two skilled pros giving it their all. There’s also a great boxing lineup set up for the rest of this year and well into next. To be sure, this travesty – we’re in the eighht right now – is emblematic to me of a very bad stage the sport has gone through. Yet, in a sense, this is the most perfect of ways to wrap up what has been a truly dark time for the sport. Ducks, mismatches, pay cable blackouts…things have been bad, friends. But now they’re coming to an end, and I’m seeing this circus as the perfect closing summation of a bad era which – hopefully – is soon to become history. By the way…as of this very second, the fight is still going. Will this never end? 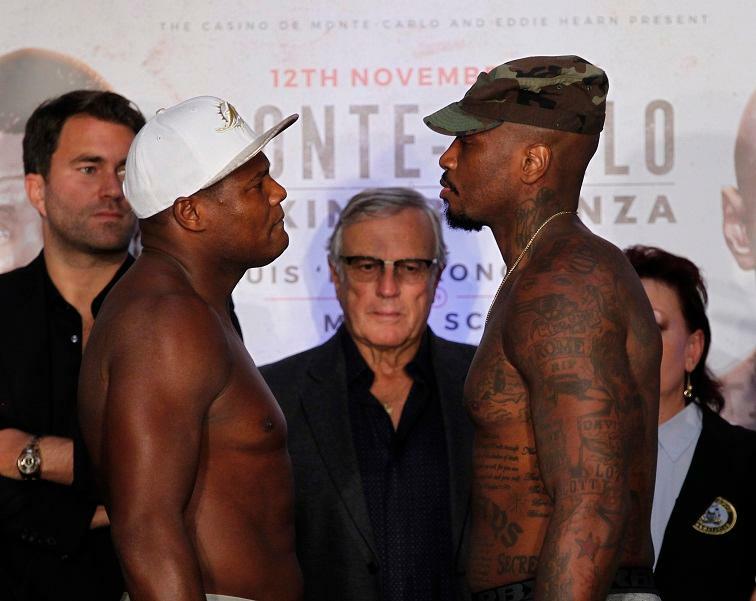 Live from the Salle des Etoiles in Monte Carlo, Monaco, an afternoon edition of HBOs Boxing After Dark presented a heavyweight fight between Malik Scott (38-2-1 13KO) against the man who is mostly seen as the most avoided Heavyweight in the world, Luis Ortiz(25-0 22KO). Scott has been very vocal on social media that he is constantly working towards the top of the division and in his own words “rebuilding rome brick by brick”. Scott last fought a year ago in October of 2015 against Tony Thompson and has only fought twice since losing a one round knockout to Deontay Wilder. Oritz will only be fighting for the 2nd time this year, with his last win coming against the same Tony Thompson in March of this year. Ortiz hasn’t been able to get very big named fighters to step in the ring with him, and recently took his talents to UK based Matchroom Boxing. Both fighters were put in a position to get title shots with a win, either with the two current belt holders in Deontay Wilder (WBC) and/or Anthony Joshua (IBF). Also the titles that have been relinquished by the Lineal champion, Tyson Fury will be up for grabs in the near future. Ortiz already has a future fight date set up for one month away on December 10th. Malik Scott came out jumping around the ring and clinching if Ortiz got even an inch to close. Ortiz twice put down his hands and gestured to Scott to come forward and actually fight. The referee was even inclined to make reference of Scotts no punching, running around the ring technique and asked Scott to engage. body shots, since Scott is trying his hardest to cover up his head and move away from Ortiz. At around the two minute mark of the fourth round, both fighters clinched and Ortiz was able to land a left hand that dropped Scott. Scott tried to complain that it was a rabbit punch, and was even helped up by the referee. Scott went down one more time, which seemed like a very clean knockdown, but was waved off as a slip. Scott asked the ref to help him up with both gloves outstretched. Scott has little bounce left in his legs and seems to already be looking for a way out of this fight. as an opportunity to take on Ortiz, and a big fight can get made. ​Boxing fans are looking forward to an action-filled November when Manny Pacquiao comes out of retirement to challenge Jessie Vargas for the latter’s WBO welterweight title on November 5; Sergei Kovalev puts several light heavyweight belts on the line against Andre Ward on November 19; and rising star and WBO junior lightweight champion Vasyl Lomachenko takes on Nicholas Walters on November 26. 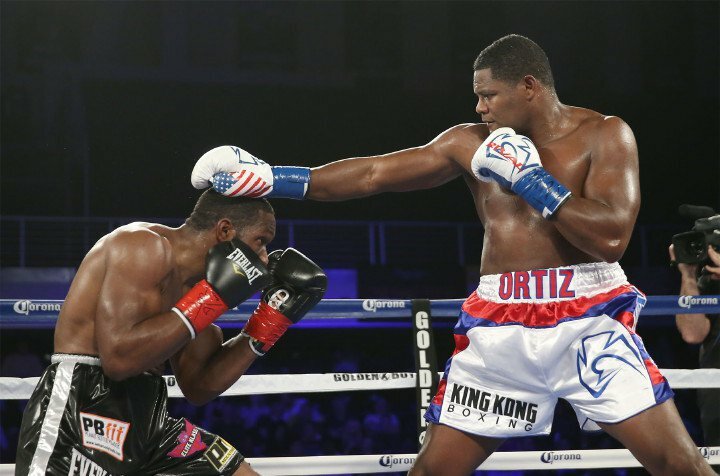 ​However, one fight that may go under the radar in November features Heavyweight Luis “King Kong” Ortiz (25-0, 22KO’s). The Cuban southpaw was set to step into the ring against Carlos Takam (33-1-1, 25 KO’s) of France on November 12 in Monaco, according to a recent report in El Nuevo Herald. However, negotiations failed at a late stage, according to trainer/manager Juan Jimenez. “Takam pulled out late, even though we had the fight set,” Jimenez told boxinginsider.com on Saturday. ​The date and venue are still being retained. “Right now we are looking at Malik Scott,” said Jimenez, but several other fighters remain possible options. Scott, 35, hails from Philadelphia, PA and has a long professional resume (38-2-1, 13 KO’s). He suffered a first round TKO loss to WBC Champion Deontay Wilder in March of 2014, and has been in the ring twice since then, defeating Alex Leapai (30-5-3) and Tony Thompson (40-5), both by unanimous decisions. ​Ortiz’s last outing was also against Tony Thompson in March of this year, and Ortiz stopped Thompson in the sixth after a rather lopsided affair. Ortiz has the extensive technical arsenal typical of a Cuban-trained fighter, but he also has wicked power in his left hand. Dynamic and skillful, “King Kong” Ortiz appeals to the aficionado as well as the casual fight fan. In a month of stellar dates, be sure to keep November 12 on your calendar.